Large Arch Address Plaque with Rope Border - - arch shape cast aluminum address sign with your house number and street name. 24" x 14". Made in USA. Features a stunning rope border. Address number line holds up to four (4) 4.5" large numbers. Street name line holds up to nineteen (19) 1.375" smaller characters. Color: dark oxide background with aluminum-tone characters and rope border. 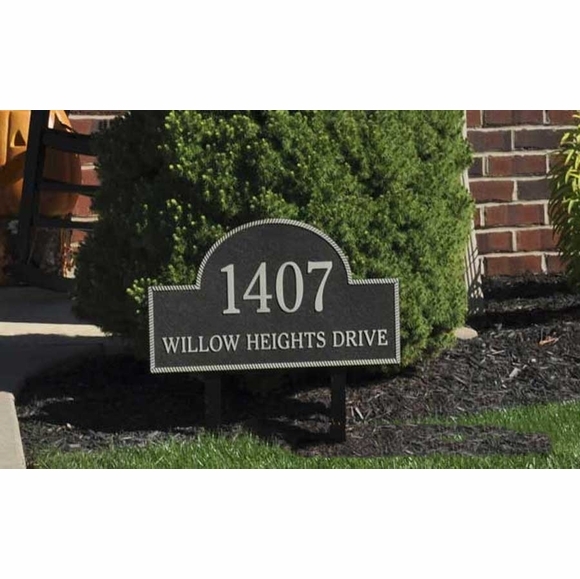 Address shown on sample above: 1407 WILLOW HEIGHTS DRIVE.